YOLO (You Only Live Once), the most popular acronym ever invented in the millennium, but there is also an acronym called YOGO (You Only Grow Old). Are these two acronyms coherent? Do they contradict with each other by principle? I’d like to change it to YAGO (You Also Grow Old), to make them coexist and coherent. YOLOYAGO – YOU ONLY LIVE ONCE, YOU ALSO GROW OLD. Growing old, with sufficient retirement fund, is something we all need to prepare and work hard for, unless you were born with silver spoon and members of the privilege few or you still believe that your children are your investments. If not, relying solely on Philippines SSS Retirement Fund appears to be not enough based on the existing Retirement Fund Policy. Well, it has never been “enough” anyways since time immemorial. Those who are employed in private sector, SSS monthly contribution is mandatory. This is mandated by law as employee’s social security. On September 1, 1957, the Social Security Act of 1954 was implemented adopting the social insurance approach to social security, covering the employed segment of the labor force in the private sector. While there are other benefits associated with SSS. Retirement Pension is the primary objective of the creation of this institution. 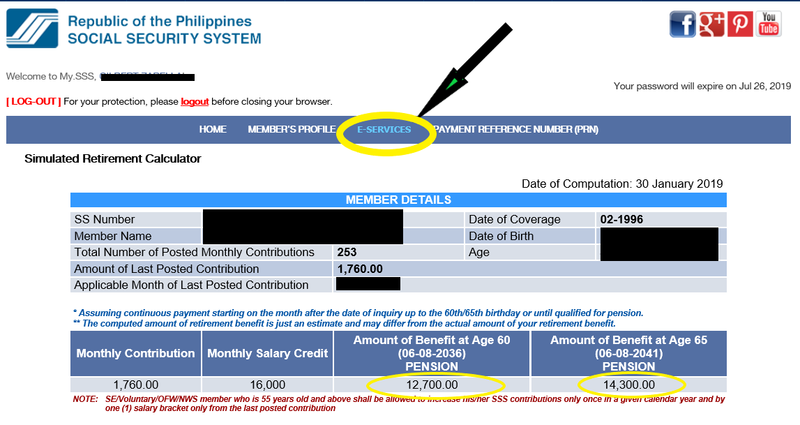 If you are curious and you want to find out how much monthly pension or lump sum you may receive from SSS when you retire at the age of either 60 or 65, SSS (Social Security System) has online simulator where it will give us the estimated monthly pension and our date of retirement. Looking at the Simulated Retirement Calculator, if I were to retire at the age of 60, the estimated monthly pension is P12,700 while if I opted to retire at 65, I will get a monthly pension of P14,300. Next Next post: 10-YR CHALLENGE: Job-hopping is a new NORM?